These numbers may look exciting, but there are still many hurdles women face on the path to professional and entrepreneurial success. The gap is slowly being bridged, but discrimination continues to exist. As we slowly overcome the challenges in the business world, more resources, including grants, loans, and women-oriented investment opportunities become available to support the expansion of women in business. However, there are still many obstacles and inequities facing entrepreneurial women and the firms they launch. More women are graduating college each year than men, and yet there is still an undeniable income gap. 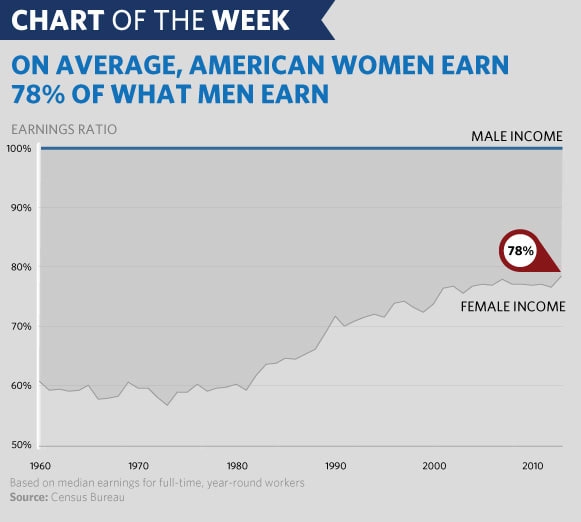 US women earn, on average, only 80% of what their male colleagues do. This gap of 20% won’t be closed until 2119 if it continues to close at the glacial speed demonstrated since 2001.3 The wage gap continues even as women start businesses. In addition to institutionalized gender discrimination, women face further business challenges in the form of undervalued labor. According to the World Bank, women are most likely to open up businesses in the informal or traditionally female sectors, which generate lower revenue.4 American women are predominant in lower-paid and undervalued caring professions such as teaching and social work, and those gaps travel with them as they create new businesses. The disparity in funding severely limits how fast and large women-owned businesses can grow, and how agile these companies can be. It may also limit the kinds of risks they can take. In many cultures around the world, women are still expected to work within the home, which can limit business opportunities. In the United States, working women with families still do more housework than their male partners, which can curtail the amount of time these women have to focus on outside projects when starting up. Globally, under-educated women may lack the skills and training that their male counterparts possess to take their businesses up to the next level.4 For example, lack of familiarity with technology and IT infrastructure can prevent a budding clothing manufacturer from starting an online store. However, there are many exciting developments, even within these constraints. Women worldwide are opening up businesses within their own homes. There are an increasing number of “mompreneurs,” including single moms, stay-at-home moms, and moms who are otherwise employed. Of course, not all women choose to become moms, and many are also joining the entrepreneurial ranks. Women-owned businesses have the potential to empower others, stimulate job creation, inject cash into the economy, and create workplace environments that may be more conducive for work and family balance. Though there are hurdles, they aren’t unknown or ignored. In fact, there are many organizations dedicated to helping women-owned business and female entrepreneurs. Let’s take a look at what they are so you can support your business ideas. Grants, Loans, and Investments: What’s the Difference? These terms are easy to confuse, but the distinctions are clear. National and state governments provide numerous funding resources for small businesses, with many targeted at women. This interactive tool created by Business USA should be one of your first steps in your search for government funding. Just answer a few questions about where you’re located, who you are, and what kind of business you run, and the tool will suggest the most relevant resources. The filter feature means you won’t have to waste time sorting through a mass of grants, most of which won’t apply to you. Powered by the Small Business Administration (SBA), the Small Business Innovation Research Program (SBIR) encourages businesses to engage in research and development, particularly those with potential for commercialization. On this site, you’ll find similar programs, like the Small Business Technology Transfer (STTR) and the Federal and State Technology Partnership (FAST), which promote technology research and implementation. These grants aren’t exclusively for women, but if your business ideas fit into the parameter, they are worth applying for. You can search for open grants for women in business on the SBIR search platform. Not content to stop with grants, the Small Business Administration also offers loans to small businesses with a demonstrated need for funding. Check out the SBA’s eligibility requirements as well as their loan amounts, fees, and interest rates, and their repayment terms. Personally, I had an unsatisfactory experience applying for an SBA loan for Ideal Bite, but you may have better luck if your business idea is a better fit for their specific programs. However, few businesses should rely on the SBA as a source of funding. In addition to federal grants, every state offers grants to small business owners, and many also set aside grants specifically for women entrepreneurs. The New York State Business Programs website, for example, details their many different kinds of loans, which are targeted towards different demographics, different regions in the state, and different industries. Check your state website to determine what statewide grants are available to you. There are many private organizations and businesses that offer grants and loans to women-owned businesses, either as a core mission or as part of their community impact efforts. This is just a sampling, there are many more out there to hunt down! This program awards $100,000 in grants for up to 10 grant recipients to wholly women-owned businesses. To be eligible, your business’ mission must include social consciousness, environmental sustainability, and innovation. You must be a for-profit or a for-profit/non-profit hybrid. This program is more about business re-invigoration than it is about starting up, since your business needs to have been in operation for at least three years. In conjunction with Bank of America, the Tory Burch Foundation offers female entrepreneurs affordable loans by connecting women with community lenders (i.e. lenders within the local community that target provide credit and financial services to underserved populations). To qualify, you must have a sustainable business operating for at least two years, and a satisfactory credit rating. You can begin the application process by filling out a loan pre-screening form. Even if you’re not interested in funding, the foundation provides excellent business education programs for women and other resources. Just starting up? The Cartier Women’s Initiative Awards may fit your needs. 6 first-prize winners of this award will receive $100K in funding, 1 year of coaching, and access to an array of networking opportunities while 12 second-place winners will receive $30k in funding. To participate, submit your business proposal online. From there, 18 finalists will be chosen from Latin America, Europe, Sub-Saharan Africa, Middle East and North Africa, and the Asia-Pacific). Finalists fly to France to present their business plans and projects in front of a panel. Though not specifically targeted at women, the $75K of award money available through the FedEx program, Think Bigger, makes it well worthy of entrance. There is a public voting phase for the judging, which provides an excellent PR and marketing opportunity, empowering you to promote your business and gain access to capital all at once. The Idea Café is a free site that regularly features different kinds of grants ranging in type, award amount, and the targeted demographic. You can sign up as a free member to keep on top of them all. Sponsored by the Small Business Administration (SBA) Office of Women’s Business Ownership, this challenge awards three winners $70k in Microsoft-sponsored prize money for businesses that impact the lives of women and have the potential for commercialization. The competition begins in localities. Each host organization nominates their winners to advance to the semi-finals, and the winners of that event will move to the national finals in Washington, D.C.
Aside from the partnerships already listed, many big banks such as Bank of America host grant competitions through their charitable arms, in addition to providing small business loans. Small local banks and credit unions usually can’t provide loans that are as large as their big counterparts, but many also offer grant opportunities that you’ll be more likely to get as a member of the community. They also often offer business development resources and community centers. Check out Texas’ UFCU for a good example. Head to your local bank’s website for more. Women are vastly underrepresented in the tech sector, a point that’s very clear when you focus on the startup community. Each year, only about 7% of venture capital is invested in management teams that include women. Fortunately, numerous organizations have sprung up to address this problem. Friends & Family Round: Most companies start their fundraising process by asking friends and family. This is the easiest fundraising process to complete, but you run the risk of spoiling close relationships over money and the valuation of shares. I recommend you only ask for the money you truly need to get your business started, then seek funding from other avenues. Angel Investor: A High Net Worth Individual who invests in your business in exchange for ownership of a part of your company or convertible debt. Seed Funding: Capital that is used to start a business. Seed funding often comes from the founders’ bank accounts, family members, or venture capitalists. Venture Capitalists: Much like an angel investor, venture capitalists also invest in your business in exchange for part ownership in your company or a portion of your profits. However, they typically are Limited Liability Partnerships rather than individuals, so they can afford to invest millions rather than hundreds of thousands. They also tend to invest a little later than angel investors—typically for what is called Series A investment round. This pooled investment allows them to risk more, and their goal is typically to take your company public or have it acquired so they can gain a very large return. Private Equity: These investments are generally made by private equity firms, VC firms, or angel investors. Simply put, it’s working capital in exchange for shares of a private company. Now that we’ve covered some key terms, let’s jump into a list of Angel and VC groups that aim to support female entrepreneurs. There are further criteria for businesses operated within certain industries like Consumer Products and Life Sciences. For early-stage, West Coast-based, women-owned businesses, the Women’s Venture Capital Fund invests in diverse teams creating focused on digital media and sustainable products and services spaces. Businesses must be efficient, scalable, and experienced, and they must offer unique proprietary value. Focused on Midwestern women- and minority-owned businesses, Phenomenelle Angels invests in businesses operating in the fields of Information Technology, Bio-Technology/Life Sciences, Clean Technology, Consumer Goods/Services, and Communications. To be eligible, your business must have a woman or minority in a C-Level position, the potential to grow big, proprietary technology, be just one year until breaking even or making a profit, and have prior backing from other reputable investors. Springboard Enterprises isn’t a venture firm, it’s where venture firms go to seek out women-led businesses. In addition to funding, female entrepreneurs will also find education, resources, and coaching, along with the possibility of a business showcase. An impressive 81% of Springboard companies still exist in some form. Belle Capital is on the hunt for early-stage companies with “at least 1 female founder or C-Level executive,” or the willingness to recruit one. This firm focuses on digital, mobile, and internet-enabled products services, as well as medical devices and CleanTech. They prefer teams with a record of experience and proven commercialization. It’s not just female founders who are underutilized – it’s female investors, too. 37 Angels focuses primarily on this latter group, drawing from the experiences and expertise of female investors. Investments range from $50K to $150K, and investees also receive valuable training and advice. Applications are followed by 20-minute phone call and then a pitch round. Just like 37 Angels, the investors at Broadway Angels are all women, and the group invests in companies with a focus on technology. Investees benefit from funding and from investors’ expertise. There are more organizations available to support women-led businesses in non-financial ways than ever before, and more are formed every day. As the largest organization for women business owners in the U.S., you’ll find a local chapter of the National Association for Women Business Owners in just about every major city in the country. Joining your local chapter means gaining access to a resource center that includes, among other features, links to funding sources. You’ll also find links to business certification programs and local networking opportunities and customized training. Submit your application online. Just as storied, large, and influential as NAWBO, the Women’s Business Development Council offers programs for women at every stage of business ownership, from startups to established businesses. As the host of the annual Entrepreneurial Woman’s Conference and Technology Makeover Competition, there are built-in opportunities for networking and to expose your work to a large audience. Services include capital programs, courses, workshops, and programs for Spanish-speaking businesswomen, as well as the opportunity to work towards a Women’s Business Enterprise Certification. Since its beginning, the Women’s Chamber of Commerce has helped women launch and grow their businesses, whether through training, access to resources, certification for businesses, retirement planning or lobbying. This also a good resource if your business relies on government contracts. Individual memberships are free. Seasoned experts and investors are essential to launching a successful business. But so is having a community of like-minded peers who are also launching businesses and encountering similar hurdles. Here you will find coaching, support, and even business referrals. Women 2.0 describes itself as a “community-driven media brand” with a focus on women in technology. The content featured on the site, which also is available through a newsletter signup, explores every aspect of being a woman in technology. Their blog network offers a platform for female entrepreneurs, technologists, investors, and innovators to gather and exchange stories and tips. The site hosts conferences, pitch startup competitions, city meet-ups, and online investor hangouts. Sprung from Facebook Chief Operating Officer Sheryl Sandberg’s TED Talk and bestselling book, Lean In, this site encourages women to go after their ambitions full-heartedly. While not specifically focused on female business owners, it is another excellent support and resources community for women with big goals. There is a library of free lectures and there are many Lean In Circles in local communities across the country. The goal of Women in Technology International is to provide women in tech with access to support from other professionals in the industry. There are educational resources and opportunities abound, and an annual conference. This is a worldwide network with support and access for women around the globe. If you live in a metropolitan area, there are likely many women-led business support groups right in your community. And if there aren’t any in your area, why not start one? MeetUp.com is a great way to find the right groups for you. Yes, you’ll want to head to a business-focused group, but also look for groups devoted to your industry. Similarly, search for national women-focused support groups for your industry, as there is a high probability there are resources available to you. More women are launching businesses than ever before, inspiring their peers and contributing enormously to the economy along the way. Though many hurdles still exist, there are just as many caring hands to help you over these barriers. I hope this guide has helped point you in the right direction toward starting or continuing your entrepreneurial journey and owning the business of your dreams. And if you see anything we missed, don’t hesitate to reach out to us at [email protected] so we can share the resource with the community! Jen Boulden is an environmentalist, entrepreneur, author, mother, and animal lover, with a long history of launching and operating successful businesses. In 2001, she founded The Anavo Group, one of the first successful sustainable-business consulting firms in the country. Shortly after, she co-founded Ideal Bite, a venture capital backed media company that was acquired by Disney for $20 million. Today, Jen helps individuals and organizations enjoy their full potential through consulting and speaking, while having fun on the farm blogging about her “light green” lifestyle. 2. Grants, Loans, and Investments: What’s the Difference?